SAN FRANCISCO — The Nikkei Angel Island Pilgrimage will be launched on Saturday, Oct. 4, from 10:30 a.m. to 3:30 p.m. at the Immigration Station at Angel Island State Park. Program with speakers and performance will begin at 12:30 p.m. 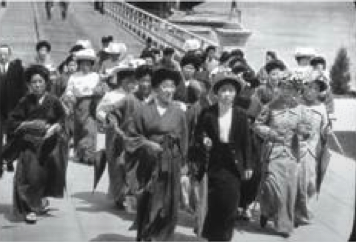 The purpose of the pilgrimage is to rediscover the little-known history of the Japanese and Japanese American legacy at Angel Island, where 85,000 persons of Japanese descent — the second-largest immigrant group — landed between 1910 to 1940, before setting foot in America. Japanese immigrants arrive at Angel Island in San Francisco Bay. • Honoring late San Francisco State University Professor George Araki and former California State Parks employee Alexander Weiss, and an exhibit relating to their “rediscovery” of the Immigration Station barracks. • Presentation by Grant Din of the Angel Island Immigration Station Foundation on new research on those of Japanese descent — more than 600 from Hawaii and nearly 100 from the mainland — who were temporarily detained on Angel Island during World War II en route to Department of Justice internment camps on the mainland. • Linda Harms Okazaki of the California Genealogical Society will guide genealogical research; participants will have free access to ancestry.com to do research on their own family trees. • Storytelling presented by the San Francisco JACL. Presented by the Nichi Bei Foundation in partnership with the Angel Island Immigration Station Foundation and National Japanese American Historical Society. • Tiburon Package: Departing at 10 a.m. or 11 a.m. Includes round-trip Tiburon Ferry ticket, park entrance fee and museum fee. $25 general, $22 for seniors 65+ and children 6-12. • S.F. Pier 41 Package: Departing at 9:45 a.m. or 11:45 a.m. Includes round-trip Blue and Gold Ferry ticket, park entrance fee and museum fee. $25 general, $18 for seniors 65+ and children 5-11. • Bento lunch pre-order: $10 general, $8 for children. For more information on packages and to RSVP, email [email protected] or visit www.nichibei.org/angel-island-pilgrimage.